It can be stressful when you have a flat tire. It messes up a day quite easily. 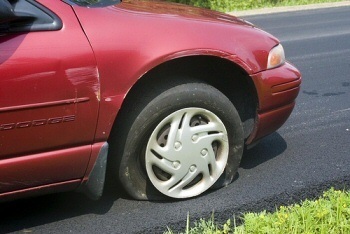 At Jack’s Auto Service, we provide flat tire repair and service to car owners throughout Grand Rapids. We service both domestic and foreign vehicles, and our team strives to be the leading auto repair facility in the Grand Rapids area. When you bring your vehicle into our auto repair facility for tires and alignment service, you will see our employees working quickly, smartly, and making sure your flat tire repairs are done correctly. In fact, same day service is offered on many of our repairs. It is a rare occurrence when a client comes back for misdiagnosis. We stand behind our work. We understand how awful it can feel without a properly working car. Your convenience is why we offer clients shuttle service. We will happily take you wherever you need to go. We do our best to remove any stresses caused by the inconvenience of auto repair. If your personal automobile or fleet is in need of maintenance or flat tire repair, we invite you to Jack’s Auto Service. We are conveniently located in Grand Rapids. You can trust our friendly and experienced staff to get your car, truck, minivan or SUV driving its best!